I will be holding a Summer Selling Exhibition at the shop which will open on Saturday 8th June and run for two weeks which roughly coincides with the Aldeburgh Music Festival. Many of the items can be seen in an on-line catalogue on the website, just click on the Summer Exhibition link. 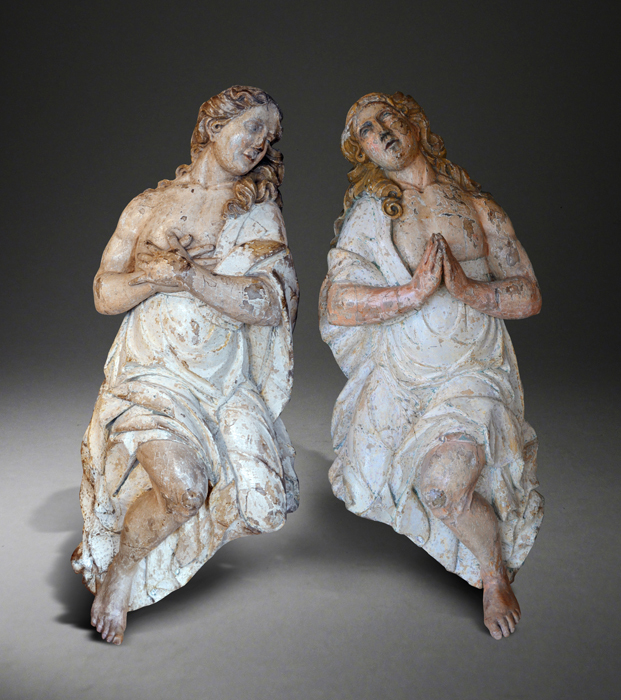 I have got some exciting pieces put away for the exhibition including the lovely untouched three tier buffet illustrated here and the large pair of late 17th century baroque angels illustrated (SOLD). Many pieces have come from good private collections including a wonderful 17th century mural cupboard together with a lovely little fruitwood drop leaf table that is illustrated in Chinnery (BOTH SOLD).There are some interesting tables including a very rare mediaeval trestle table, a nine feet long English farm table in figured ash and low dresser in oak of similar length. There is a charming single gateleg late 17th century writing table with two drawers (SOLD), a tiny oak gateleg table with an unusual base (SOLD)and a credence table of simple form. There are two good benches - one from the 16th century in walnut with lovely shape to the apron, the other in oak from the Commonwealth Period. Other pieces of furniture include a 17th century desk box with wonderful inlay (SOLD)and a Georgian oak lowboy with a beautiful burr top. 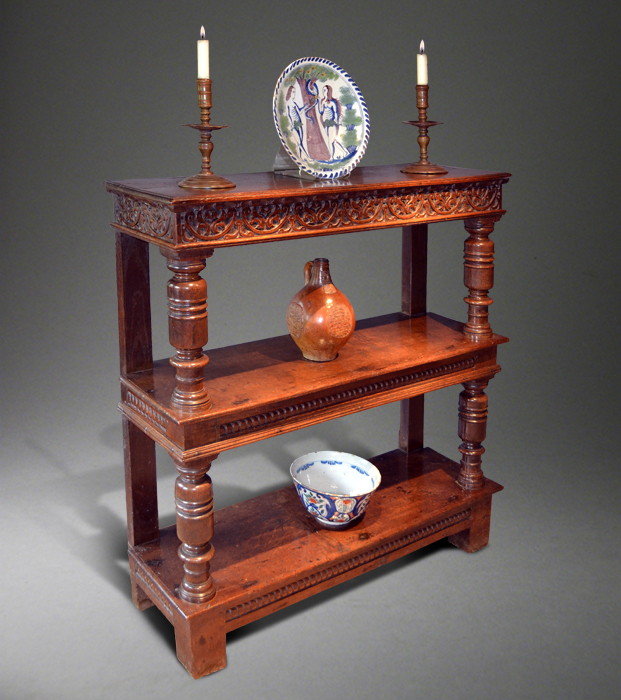 Amongst the works of art is a fine Civil War Period portrait of a Royalist commander, a good Bellarmine jug (SOLD), a large maiolica wine cistern, a private collection of Old Master drawings, an interesting early candlestick (SOLD)and an unusual oak cupboard probably intended to hold an hour glass (SOLD). Please contact me by telephone or email if you would like any further information.